Okay, I admit it. I’m prejudiced against dialogue tags. Yes, I know they say, ‘He said/she said’ are invisible to the reader. Even if you don’t share my pet peeve, why settle for something so boring? You write a sparkling line of dialogue, and slap ‘he said’ on the end? Why not continue the sparkle instead? 1. The ONLY time you need a tag is if the reader wouldn’t know who was speaking otherwise. I’m always surprised by how many NYT authors have tons of unnecessary tags. If there is only a man and a woman in the scene, and someone says, “Excuse me, I have to go to the ladies room.” do you really need a tag? Many times the dialogue itself cues the reader. 2. Names. I’ll bet you need them a lot less often than you think. Of course they’re essential at the beginning of the scene, because we need to know who’s in it. But unless there are more than two people, you probably never need use the names after that. 3. Tags slow the conversation. In conflict, nothing kills the tension like unneeded tags. 4. Adverbs after tags make my teeth grind. This is the worst offender, and it’s seen as a newbie error. Yes, I know you could pick up a book in your library that has a line like, “How dare you?” She asked indignantly. Turn to the front of the book. I’d be willing to bet that the book was published before 1970. Nowadays, readers are much more sophisticated. Easy way to edit them out? do a ‘Find’ for ‘ly’. Stephen King said, “The road to hell is paved with adverbs.” Word, Steve. You’re thinking this would be a lot of work? No way! This is where the fun is! 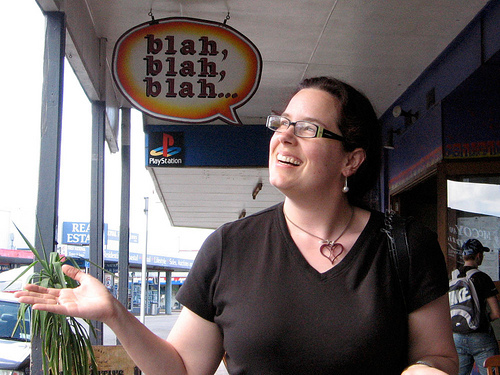 My favorite writing teacher, Margie Lawson, suggests using what she calls Dialogue cues. I’m not going to go into huge detail, because I want you to do your writing a favor and take her Writing Body Language and Dialogue Cues Like a Psychologist, course. If you miss the class, you can always purchase the lecture packet. You’ve heard that rich writing serves dual purposes, right? A dialogue cue does that as well. It cues the reader in as to whom is speaking, but then goes much farther, telling the reader how the line of dialogue is being said. It can add body movement – and give a glimpse into how a POV character, or better yet, a non-POV character is feeling. It adds richness. BEFORE: “We don’t need your boyfriend’s charity,” Max said. AFTER: “We don’t need your boyfriend’s charity.” His voice sounded like a peach pit in a garbage disposal. BEFORE: “I’ve hunkered down here for years with my hard, silent Dad. I held on tight, trying to keep things from changing,” he said. AFTER: “I’ve hunkered down here for years with my hard, silent Dad. I held on tight, trying to keep things from changing.” He looked down at his bloodless fists. BEFORE: “But if you don’t know all this about yourself, it doesn’t matter what I think,” He said. AFTER: “But if you don’t know all this about yourself, it doesn’t matter what I think.” He shut his mouth, closed his eyes, and grabbed for all the guts he had. BEFORE: “Oh, Bree,” Wyatt said. AFTER: “Oh, Bree.” His words trailed off, as if he’d run out of breath. Do you see how the dialogue cue not only tells you whom is speaking, but shows you how they’re saying it? It’s a perfect opportunity to get the reader on a deeper level, and to write fresh at the same time. So, what do you think? have I convinced you to weed out dialogue tags? A WITS reader challenge: Read over a dialogue sequence you’ve written. Did you find any extraneous tags? Have you thought of any way to jazz them up and write them fresh? Share the ‘before’ and ‘after’ in the comments, so we can all learn! Laura’s debut book in her Sweet on a Cowboy series, The Sweet Spot, has just been chosen as a double RITA finalist! 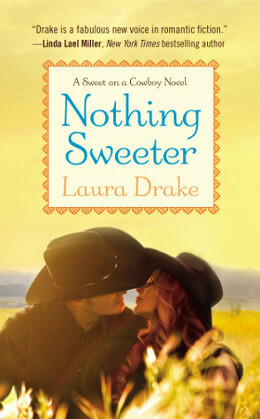 Publisher’s Weekly review of Nothing Sweeter: “The second entry in Drake’s Sweet on a Cowboy series (after The Sweet Spot) is another character-driven contemporary western with more heart than heat. Rancher Max Jameson, stunned by the unexpected death of his father, is determined to keep the family spread in Steamboat Springs, Colo., despite pressure to sell to a greedy neighbor. His brother, Wyatt, tries to help out, though the sibling relationship is strained due to Max’s discomfort with the fact that Wyatt is gay. Author of romance and women's fiction. Grand Central and Harlequin author, debut book, The Sweet Spot, due out May 28. This entry was posted in Craft and tagged Laura Drake, Nothing Sweeter, write great dialogue, Writers in the Storm, writing. Bookmark the permalink. Paying attention to different ways of speaking helps writing dialogue, too. Which is even more effective when you have a stretch of to-and-from with no tags. There all sorts of ways to do this, ranging from obvious and cliched to subtle and elegant. Big differences include mis-handling of parts of speech such as contractions, pronouns or articles. Less big differences include vocabulary and word-choice, different levels of verbosity, favourite words or epithets, etc etc. Staticsan – can you give us a couple of examples, so we can see what you’re explaining? Not sure I can give a good example, but I’ve chosen one where one technique is lampshaded. This scene is where two of them (Jacint and Amiesha) meet the other two for the first time and they’re just relaxing. After a few minutes, Guron’s efforts paid off and they could watch the flames licking up the wood. “It sounds like someone was being enthusiastic,” said Merak. “You and your fancy words, Merak,” said Guron. “Or just red hair,” said Amiesha. “But your mam was as blonde as you,” said Jacint. There was a few minutes silence. The rain sounded like it had eased off a bit. The light from the hearth made the tiny hut feel warmer than it really was. I love dialogue tags, especially if they bring you into the scene and let you know what the characters is doing/feeling. This before/after is with Lindsay, watching her neighbour through the window and her phone rings. Clue: The ‘ring tone’ let’s us know it’s her friend Tina. At that moment, ‘Wasted’ began playing on her phone. “What’s shakin’ bacon? Still watching Hot Stuff next door?” asked Tina. “You are such a liar. I’ll bet you haven’t touched your mouse until just now.” Tina challenged. “I shouldn’t have told you what he was doing,” said Lindsay. Lindsay dropped the curtain as if burned. “No.” She plopped down into her chair and faced her computer, which had gone into screen saver mode. “I’m at my computer.” She jiggled her mouse and a CAD program flashed up onto the screen. Lindsay let go of the mouse. How did Tina always know what she was doing? It was like she had a spy camera in her office. Once again, Lindsay scanned the room, suspicion lurking. Susan, I like your voice – cute scene! This is a handy list. “I don’t get it,” she whined. “Well, you’re stupid,” he snarled. “Hey, quit it, you guys!” was the other chick’s reply. “I’m done with this conversation,” he growled. He jumped onto his horse. “Away!” he hollered. …and it was by no means the first one I’ve seen written like that. Just as irritating as adverbs, at least to this reader. You’re right, Kate – adverbs, one word adjectives…they’re all pretty much passe. I hate the “said” tags, refuse to use them. And I grit my teeth over variations on the word said–exclaimed, rejoined, cried– makes me cry. Glad to hear from other haters. 🙂 Great post. Thanks, Darla, hope they help! Great post. I love every thing Margie teaches in her classes. Her body language and dialogue cues class is awesome. I could take it once a year and learn something new every time. Dialogue cues is something I have to work at to get them right. Lisa, funny you should mention that! Margie inspired me to push that dialog cue when I was at Immersion class! Thanks for reading. I can’t agree that your “afters” are better writing. “He said” leaves it to the reader’s imagination, which in most cases will suffice. Your “afters” sound self-conscious and amateurish. You’re trying too hard, you’re not trusting your reader; you’re actually restricting the reader by using forced similes, over-wrought phrases, and nebulous, silly-sounding metaphors like “he grabbed for all the guts he had.” What is this: a beer commercial? Out of curiosity – what genre do you write? Are you published in fiction? The techniques taught in Margie Lawson’s workshops are research-based on NYT authors. Yes, I am a published novelist and essayist. I make my living as a writer. It’s true that I don’t write genre fiction, and perhaps that’s where the difference lies. I have a feeling you’re not a genre author, Joesph. Pick up any genre book on a rack, and you’ll find this technique used, successfully. But everyone likes something different, and that’s a good thing. Thanks for stopping by. You may be right that it’s a genre fiction thing. You’re certainly right about novelists using too many dialogue tags, anyway. I’m on the 9th draft of my current opus-in-progress, and I’m still weeding them out. Good luck, Joseph! Writing is hard, no matter WHAT you write! And I apologize for my earlier tone: I was overly harsh. Excellent, Laura! I recently read a book that kept on going back and forth with the tags “he said”, “she said”, even though I could figure it out on my own by the tenth time, and I wanted to shout “I KNOW who is talking!” to the book. Thank you for these helpful before-and-after examples. Bottom line: if your dialogue tags stand out and/or distract the reader, they need more work. I share your pet peeve! Going to share this link with my Creative Writing 101 workshop! Thank you for the reblog love, Bette! Laura, first let me say congrats on the RITA noms!! I’ll be there in the audience cheering you on. Can’t wait. Great article. I love writing dialogue and my first drafts contain pages of untagged dialogue so I have to pay close attention to giving each of my characters unique “voices”. I’m currently taking Margie’s Writing Body Language and Dialogue Cues and am learning a ton of useful things. It’s between the hero and the heroine’s daughter. If I’ve done my job right, then I don’t need tags but I’m sure it could use cues like I’m learning from Margie. And there’s a bit of unwritten subtext like I learned from Tiffany’s class. “Uncle Leem doesn’t. Every time Mommy says something about my Grampa Mac and Mrs. Tuttle, Uncle Leem says eeww and does this.” Fiona covered her ears with her hands. How sweet, Carol! I think you’ve captured a child’s innocence. And I have no problem knowing who’s speaking. I didn’t go into that in the blog, but an accent or way of speaking (as with a child) can clue the reader in, avoiding a tag as well. This is a really good example of what I said earlier about using different ways of speaking to help distinguish between characters. This is such GREAT advice about dialogue tags. My favorite writing is dialogue and I’m learning to use all those rich additions without the typical “said” tags and it’s WAY more fun now. I’m jealous, Patti. I use dialog, of course, but it isn’t my strong point. I really have to work at it. Rewrite: Amelia threw her arms around Liddie and hugged her tight. “Please forgive me.” Amelia’s voice cracked as she whispered that desperate plea. Carol, nice! If it were me, I’d stop at “cracked”. You’ve ‘showed’ us from the dialogue line and then that her voice cracked that it is a desperate plea. And showing is always better than telling, right? Thank you for posting! Good point, Laura. I’d lose “whispered,” but on reflection I don’t miss it. Great post and examples. Loved the Margie classes I’ve taken! Tweeted/shared! Steven King was one of my favorite writers. I thoroughly enjoyed his On Writing book. I had to go back over my writing and look for all of the “ly” tags in my writing. Oh boy, I have some editing to do. I am rather fond of adverbs in my writing. I must resist the urge to add adverbs to my writing. One of the reasons I blog my fiction is to improve my writing. By learning to remove the adverbs, I hope that my writing improves. Allen, I have a pet peeve about adverbs, too. Funny thing about them….if I write one in a sentence, then go back and reread it without the adverb, it’s almost always stronger without it! Your tip to search for “ly” was really helpful as well. Good trick for editing out those pesky adverbs. Oh dear. I am guilty of sometimes using an adverb after a tag, she says MEEKLY. LOL I’ll try to do better. Congratulations on the DOUBLE Rita nominations! Thank you Debbie! I’ve never noticed adverb over usage in your book! I look for a rhythm. A “said” here and there. Some tagless dialog. Some dialog supported by subsequent action. As long as the scene flows, I’m not going to overemphasize the specific use or omission of dialog tags. Chopping adverbs is critical to making the work sound professional, at least to my ear. I was going to make this exact point but Eric beat me to it. 🙂 For me personally, I prefer a mix of all three of the techniques he describes. A long stream of tagless dialogue doesn’t work for me, and neither does a conversation loaded with those emotion-rich actions and gestures. I’ve read and admired your work, so I know you don’t overuse them, but I think the “said” tag is a neutral choice that allows you to place emphasis on those moments elsewhere in the scene when you really want the emotional description to have impact. Not every morsel of conversation has a strong emotion behind it, but that doesn’t mean it’s not needed on the page. I sometimes like to break up a sentence or group of sentences with “she said” on purpose, to create emphasis and rhythm. I also make judicial use of the “… he said, twirling his wedding ring on his finger” type of construction. I know Margie isn’t a big fan of participles like that, and i see why she makes that point, but I also think sometimes the fact that someone is making a gesture or action while speaking is relevant. Sometimes you don’t want the gesture to begin and end in that moment; sometimes you want it to be ongoing. And I will even argue that the occasional adverb is not only permissible, but useful. Think I’m more of an “everything in moderation” gal than a “pet peeve” gal on this one! We’re twinsies! I agree 100% with everything you wrote. Except the gal part. I’m not one, if you couldn’t tell from my pic (not that there’s anything wrong with it!). I opened my WIP to see if I could find an example of what I’m talking about, and came right to this section. It’s not an emotionally loaded scene, just a conversation between friends that introduces a character (Charlie) and sketches in a little information about him that will become relevant later. Oh, and Narwhal is Charlie’s cat–the MC is a vet and she is examining the cat throughout the scene while she talks to Charlie. “I know,” he says archly. “You can love somebody and still want them to leave you alone,” I say, lifting Narwhal’s lips to peer at her gums. The adverb–archly–is in there because I wanted to convey a spark of Charlie’s personality by showing that he gives that line a deliberate, knowingly mischievous emphasis. The sentence of dialogue itself (“I know”) is way too neutral on its own to “show” Charlie’s tone, and it’s far more economical to write “… he says archly” than it would be to try to devise a gesture or action that conveys the precise shading of the word “arch.” This is when I think adverbs can work–when the words of the dialogue themselves are devoid of tone, and when a gesture/action either wouldn’t convey the tone or would be overkill. You have a good arrangement in that scene. It flows quite well, considering I don’t know the characters and have little context. Although I’m not in love with adverbs, I’m not a fan of absolute rules, either. You’re right in spare application of them being economical. Thanks, Bethany, for wrapping it up in a neat bundle! You’re right – anything, even sparkling writing, dulls with overuse. Sounds like you have a firm grip on it! Eric – you’re right about rhythm. Margie calls that ‘cadence’ and though I can’t define it, I sure know it when I hear it! Thanks for commenting! Grammar is a piano I play by ear, since I seem to have been out of school the year the rules were mentioned. All I know about grammar is its infinite power. To shift the structure of a sentence alters the meaning of that sentence, as definitely and inflexibly as the position of a camera alters the meaning of the object photographed. Many people know about camera angles now, but not so many know about sentences. The arrangement of the words matters, and the arrangement you want can be found in the picture in your mind. The picture dictates the arrangement. The picture dictates whether this will be a sentence with or without clauses, a sentence that ends hard or a dying-fall sentence, long or short, active or passive. The picture tells you how to arrange the words and the arrangement of the words tells you, or tells me, what’s going on in the picture. Nota bene. It tells you. Thanks Laura! I’ll be looking for these sorts of newbie errors as I continue my revisions. I may be a newbie to fiction writing but I don’t want an agent to think so. With an attitude like that, Cerrissa, you won’t be a newbie long! Use dialogue cues, not tags! Thanks for the reblog, jbiggar! I loved your dialogue cue above, His voice sounded like a peach pit in a garbage disposal. Nice! I’m taking Margie’s dialogue cue class also and loving every lecture, though I’ll need to go over it a few times before the cheesecloth in my head takes it all in, lol. “Sara,” he moved to kiss her again, only to have her back skittishly away, clunking her head against the cupboard door behind her. “Stop Nick, I can’t do this. I’m sorry but I just can’t.” She rubbed the sore spot on the back of her head watching him warily as he stepped back with a wry grimace. “Sara . . .” His heart pounded a message of more, more, more. He wanted his mouth on the arch of her neck where he could see the matching beat. At the hungry intent obvious in his gaze she jumped back, clunking her head on the cupboard door behind her. “Stop Nick, I can’t do this. I’m sorry but I just can’t.” The desperation of her tone drove him back a couple of steps and they eyed each other warily. Her rubbing the back of her head, him rubbing his pride. Laura, I’m truly late for the dance. It’s midnight on the east coast and I just got back to my computer. Dialogue tags? I think I’m one of those that splits the argument down the middle. While the he said, she said, is not always the solution (except in long dialogue where I think it helps) … I also am not fond of having every tag become meaningful. Often I worry that some of those become excess verbiage. So, I am on the fence. Love, the examples you gave. Loved all the great examples left in comments. Aw, thank you, Florence! And I agree – anything (even good writing) can be overdone. Go write something – I want to have your book in my hand someday! “Enlightening!” She pointed to the lightbulb that flashed above her head. Okay – I’ll go over my ms’s again! And congratulations on the Rita nominations. Well deserved. I loved the book, it shows a more mature look at love than a lot of romance out there. Good luck! Thanks for this post, Laura, and congrats on the RITA nominations! I just got out of a live workshop with Margie Lawson today. The section on dialogue cues was eye-opening for me. I realized that I’ve been avoiding them, because they seemed like telling rather than showing (in other words, I’d been brainwashed into thinking that all the tone and emotion behind the dialogue should be apparent from the dialogue itself). As a result, readers sometimes have trouble connecting emotionally with the characters. I feel like I’ve got a brand new tool in my toolbox, and I can’t wait to start using it! Oh Andrea, that’s awesome! Don’t you LOVE when that happens? Margie will do that…you should take her ‘Empowering Characters Emotions” – It was a paradigm shift for me! Andrea, thanks for your comments about readers having trouble connecting emotionally with characters. That makes sense and I’m going to show it to a writer friend who emailed me saying her ms was rejected because the editor couldn’t connect emotionally with the heroine. Maybe this will help point her in the right direction. I can tell when something is “off” but not always know the solution to help fix it. This might help me help her. I’m going to a live workshop with Margie in April and am really looking forward to it. Can I still comment on this? Your examples were wicked helpful. I was told that the “action” after a bit of dialogue is telling, not showing. I never quite agreed with that and I feel like your explanation makes more sense. I’m going over the first 15 pages of a contest submission right now (I am a finalist! yippee!) and making my dialogue passages stronger. Thanks! Sure you can comment, Megan! Glad it was helpful. If you like this, check out Margie Lawson’s classes-she’ll help you a lot! Good luck with the contest!